Cruises to Antigua depart from many different ports throughout the world and make their way to the island paradise that is the Caribbean. While the cruise ships dock in the deep water port of St. John’s on Antigua, divers and hunters can take a short boat ride over to Barbuda, a mecca for them on a virtually unpopulated island, taking in one of the many Antigua tours offered. With just a quick jaunt over the 26 miles that separate the two islands, many travel agents will connect the two as one stop in a Caribbean tour. The best Caribbean cruises are the ones that take you to many different islands so that you can truly get a taste of why each stands out from the rest. Cruises to Antigua highlight the country’s history, and allow you to snorkel, swim, scuba dive and explore the island at your leisure. The highlight of the island of Antigua is the miles and miles of unspoiled white sand beaches and warm Caribbean waters, but she also has a rich history. Touring Shirley Heights Antigua: Nelson’s Dockyard National Park is one way to learn this history and how Antigua has changed throughout the centuries. Cruises to Antigua will also allow you to see the incredible natural formations found throughout the island. The Pillars of Hercules and Hell’s Gate are both made out of rocks that have been eroded by the tides over time. Today they are tourist attractions as towering testaments to an earlier time. Of course, there are plenty of other things to do in Antigua as well, including scuba diving tours of old shipwrecks, mountain climbing and biking, to name but a few, and as always the beaches and warm ocean are always inviting. 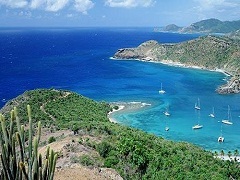 Make the most of Eastern Caribbean cruises by choosing one that makes the stop on Antigua. Cruise lines each have their own itinerary and some do include Antigua in them travelling from various ports and using differing routes in and around the area. Antigua is home to many beaches, lots of bright blue sky and wonderful opportunities to explore the underwater region surrounding it. It is a lovely place to relax in the sun or to go for adventure, and it makes a great addition to any cruise. Cruises to Antigua will astound you especially if you enjoy history or natural surroundings, unblemished and less crowded than its neighbours.